Chris is Chief Medical Officer at HealthReveal, whose mission is to preempt avoidable consequences of chronic disease. Through continual monitoring of health data, HealthReveal not only predicts which patients are at high risk for adverse events such as strokes, but moreover identifies the guideline-directed therapies needed to improve care. Chris is a Board-certified emergency physician who earned her SB, SM and PhD in Computer Science and Engineering at MIT and MD at Harvard. 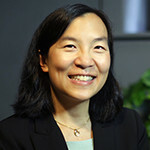 She trained at Massachusetts General Hospital and Brigham and Women’s Hospital, after which she worked clinically until 2010 when she became Chief Medical Officer at AFrame Digital, focused on real-time personalized trending of physiological signals for chronic care. She also served as Director of Medical Analytics at ACT.md. She has authored peer-reviewed articles as well as Blueprints Clinical Cases in Emergency Medicine, and has presented her predictive modeling research both nationally and internationally.